11 JUN. 2013. The presidents of the United States, B. Obama, and Peru, O. Humala, agreed today to promote educational exchanges between the two countries and strengthen cooperation against the "scourge" of the drugs. "The state of our relationship is very strong," summarized Obama after receiving Humala in the Oval Office at the White House. Both pledged to promote educational exchanges within a program created by the Obama administration to have 100,000 American students in the United States and the same number of Americans in Latin America. Also to give instruction and train "high quality" Peruvian teachers and students living in the United States. "I am confident that under your administration we will improve substantially and qualitatively the fight against the scourge of drugs," said Humala to Obama. According to Obama, both spoke of how to deepen, "at a strategic level," the work to continue the fight "against the scourge of transnational drug networks, which have a negative effect not only in Peru, but throughout the region." In its latest annual report on the fight against drugs in the world, published in March, the United States welcomed efforts of both Peru and Colombia to curb its role as a major producer of coca and drug suppliers globally. 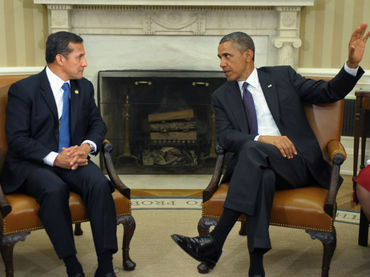 Peru has in the United States "a partner with whom you can work" and has an economy "that builds trust," said Humala. For his part, Obama stressed that Peru is "one of the strongest and most reliable partner" of the United States on the continent and congratulated Humala for being able to "sustain high growth rates" in his country, which has reduced poverty and inequality. Peru and the United States has a free trade agreement (FTA) which came into force four years ago and that in 2012 generated 16 billion dollars in bilateral trade, according to the White House. On the economic front, Obama highlighted the joint work that Peru and the United States have made in the negotiations to achieve the so-called Trans-Pacific Partnership Agreement (TPP, in English), which also includes nine other countries. This agreement offers the possibility of opening new markets in the Asia-Pacific "with high standards and protections for labor and the environment," Obama said. The visit "is a sign of the political will of Peru to strengthen the relationship with the United States," said Humala, who said he found in Obama "disposition" for that to happen. With Obama "we fully agree on the importance of strengthening democracy, respect for human rights and open economies to improve trade," said the Peruvian. The Peruvian president is making a three-day official visit to the United States and today, after meeting with Obama, attended a working lunch with Vice President Joe Biden. To end the day Humala will have a conference at the Chamber of Commerce of the United States on the presence of Peru in the Pacific Alliance, a block which also includes Chile, Mexico and Colombia. On Wednesday Humala will visit the Organization of American States (OAS) and then will travel to Boston, where he will meet with the governor of Massachusetts, Deval Patrick, and visit the campus of the Massachusetts Institute of Technology (MIT) before heading back to Lima.